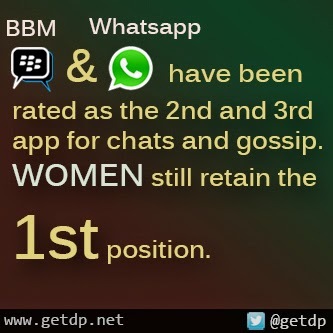 GETDP: BBM‬ and ‪Whatsapp‬ have been rated as the 1st and 2nd app for chats and gossip. Women‬ still retain the 1st position. BBM‬ and ‪Whatsapp‬ have been rated as the 1st and 2nd app for chats and gossip. Women‬ still retain the 1st position. BBM‬ and ‪Whatsapp‬ have been rated as the 1st and 2nd app for chats and gossip. Women‬ still retain the 1st position.